A family of cavemen known as The Croods have survived by knowing how to live in fear of the outside world. They only leave the safety of their cave to hunt for food. 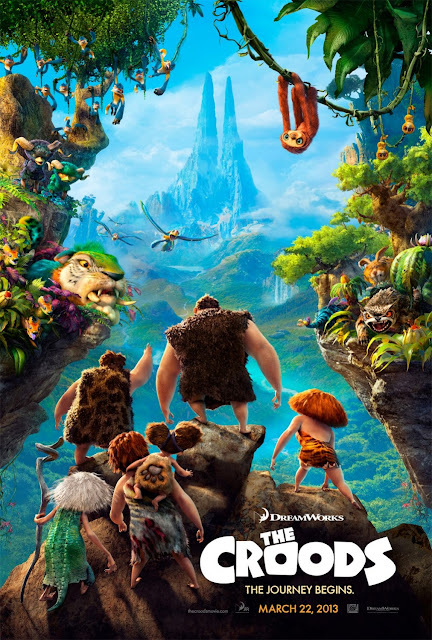 When their cave is destroyed, the Croods are forced to leave the safety of their sanctuary and venture out into the big, wide, and unknown world in search of a new home. "The Croods" is a prehistoric animated family adventure comedy. Odd, but not unexpected. Nicolas Cage voices Grug, the patriarch of the Crood family. Everyone enjoys the stories told by Grug, which are life stories about people who try to go on an adventures, but always wind up dead. The moral is: stay in the cave and you'll stay alive. The rest of Crood family consist of Grug's wife Ugga, voiced by Catherine Keener, their son Thunk, voiced by Clark Duke, and their much more free-spirited daughter Eep, voiced by Emma Stone. Finally, there is Ugga's mom Gran, voiced by Cloris Leachman, because of course there would be a whining grandparent who Grug isn't exactly fond of...and of course he going to show visible disappointment every time she survives some mishap! Even in prehistoric times did people not get along with their in-laws! C'mon, it's supposed to be funny!!! As we mentioned, Eep wants more in life than simply living in a cave, and regularly wanders off without telling anyone where she's going. While out exploring one day, she meets Guy, voiced by Ryan Reynolds, who is much more like a modern man and is nomadic. Guy doesn't confine himself to a cave and uses his smarts to survive in the world. Of course, therein lies the conflict between Grug and Guy. They have different philosophies on life, and where one is more reserved, the other thrives on freedom. As Eep finds herself more and more drawn to both Guy and freedom, she will eventually have to choose her own path: stick with what she knows and stay alive in her cave with her family, or risk it all for a small taste of freedom and a chance with Guy. Though it seems as if "The Croods" is meant to have some larger, bigger message for kids, we honestly found ourselves not caring about this movie. It lacks a lot of development outside of the expected, typical faux-Disney formula and attempt at a deeper meaning story line, plus, we couldn't ever get attached to the characters. The landscape of "The Croods" is almost more fantastical or alien-like rather than something prehistoric, but taking place in the early BCs, the animators obviously get a lot of leeway with what they can do visually. Most the animals filling this environment are hybrids, creatures that look like owl cats, mammoth giraffes, parrot tigers, and other mashups of what we know today as 'regular' animals. Though we don't necessarily mind this take on early mankind, the movie is only slightly enjoyable. Kids will get swept up in the visual spectacle of it all, and it is entertaining and colorful enough to sit through, but it has nothing there to really wow us, especially when considering the crux of the story revolves around a father locking his kids (specifically his daughter) away from the world. Rapunzel much? This film feels like it's a step back in the grand scheme of animated films with deeper, more meaningful messages adults won't mind playing for their kids over and over. We can see adults getting tired of hearing Nicolas Cage's voice on a loop. Plus, the voice work is only so-so. We have seen many better animated movies, and not just from Disney/Pixar. This one settles into the middle of the pack, and when it's all said and done, we found ourselves wanting more from "The Croods," especially since it was nominated for an Oscar. Do we recommend the movie: Meh. One year ago, we were watching: "When Strangers Click"